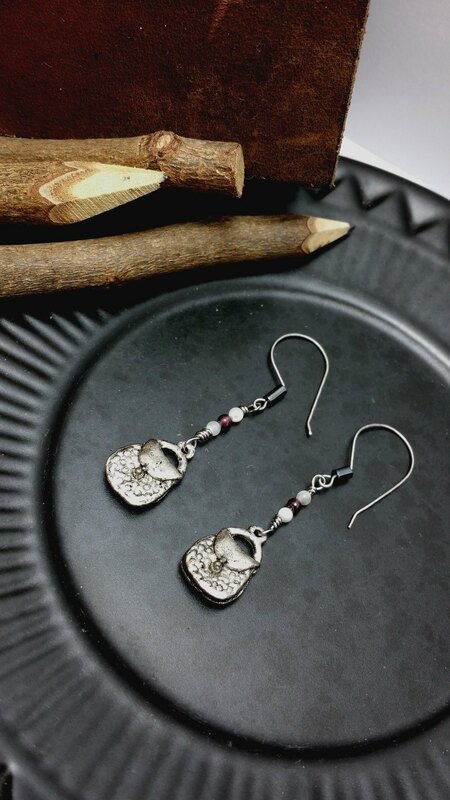 ** ◎ Product Specifications ◎ ** ● Product Features Shell beads with different angles, turned beautiful luster Garnet red light and point out the color Will that cute little bag hanging on the ear it! ● Material: Shell Beads / red garnet / Hematite Stainless steel ear hook / copper plating ancient silver pendant bag Ancient Silver Features (plating is Even in the case of oxidation over time Can still appear a simple texture) ● Size: Total length of 4.5cm (including ear hook) ** ◎ Maintenance ◎ ** Natural crystal, pearls, shells, minerals, jade, wood and other materials → Can be used wet toilet paper or cloth wipe. Plated metal material → ** Jewelry plating material over time and the environment, a natural oxidation fading phenomenon. ** To mitigate oxidation fade, it is recommended to remove the bath, such as prolonged encounter water or prolonged contact with sweat wear, perfume and other chemicals, the situation will accelerate the oxidation fading, ** Plated metal oxide are unable to respond after the original luster fade **, avoid contact with water as much as possible. ● If you do not usually go out to play with the jewelry, Keep it in a box or zipper bag This can be extended to keep it beautiful state Yo! ** ※ Note ※ ** → real product may vary depending on shooting light and display different color on each computer screen, and will be some color ** **. → natural minerals, pearl, crystal, jade, wood and other natural materials .... ** Due to the environment caused by the formation of neither the same every single color texture ** ** Also slightly small flaws might crack ** ** 100% and therefore can not exactly ** Images, It's like natural creations unique identity card ah ^ ^ But the production of every single material all items will be carefully selected to make good person, make sure to accept and then the next single Oh. ** → Since all the buildings are all hand-made goods, will inevitably leave a little hand-made signs (can not be 100% symmetrical zero error) ** Such orders do not mind Oh. ** → plating metal jewelry will be oxidized over time to produce the case faded, ** this is a normal situation, such as the next single Oh do not mind. → As for metal (plated metal or brass) allergy, usually only wear silver, gold, jewelry or medical steel material and the person who either do not know whether their own skin allergy to metal, it is recommended to avoid orders Oh ~ case if the allergic skin discomfort that may harm than good ah ~ ~ ** ● Be sure to accept the above considerations, then the next single Oh! ● ** ** ◎ origin / manufacture ◎ ** Taiwan's production of handmade ** ◎ ◎ ** Brand Story "Chōdo ii" January u-do for the Japanese chi い い pronunciation, Means "just right." How much promise a lot of things in life, just good enough. It was a very lazy but it will not make people comfortable balance. Want to make this hand temperature, to convey to you / u In fact, happiness is so simple and beautiful.